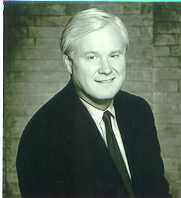 Chris Matthews, the mouth that roars on MSNBC, doesn't have the energy to raise his voice these days. The Hardball host is lying in a hospital bed in Washington, D.C., often delirious, recovering from a case of malaria that sent his temperature to more than 103 this weekend. Doctors aren't sure when he picked it up, but suspect it was on one of his trips in recent years to Africa, Vietnam or the Middle East. Malaria can incubate for four years. "I'm just mentally and physically depleted," says Matthews — an admission that might surprise fans and foes since Matthews never seems to run out of energy. Matthews, 56, laughs at the irony but says that after Friday's show it took him 10 minutes to muster up enough strength to walk from his car into his house. He says he feels like one of the brothers in Beau Geste, the 1939 French Foreign Legion film "where they touch each other to see if they're still alive" or Gregory Peck as the injured writer on safari in The Snows of Kilimanjaro, "laying in the tent, getting weaker, never doing anything about it." He's taking a mixture of quinine and antibiotics and hopes to be on his feet by the end of the week. Until then, Mike Barnicle is sitting in.